Homeowner Josh Brown, left, confers with Belfast Fire Chief Jim Richards Sunday as firefighters from three communities finished extinguishing the fire that consumed part of his Blueberry Lane home. 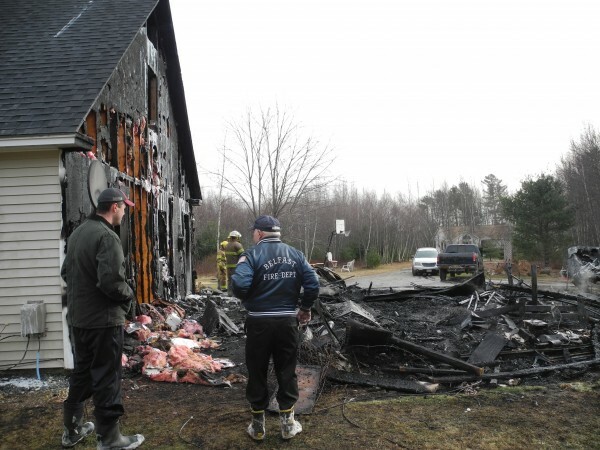 BELFAST, Maine — More than two dozen firefighters from three communities worked Sunday morning to save a Belfast house from being consumed by flames. No one was injured in the effort to extinguish the Blueberry Lane fire, which apparently began in the garage attached to Josh Brown’s home. Brown was home with his wife and two kids when the fire began in the late morning. He said there was just enough time to run to move the vehicles, one of which had started to burn. A half-melted power boat was moored in the wreckage of the garage. Richards and Brown said that the interior of the home appeared to be in pretty bad shape, too. According to Brown, the home is insured. Richards said it was too soon to tell how the fire began. Firefighters from Belmont and Morrill assisted the Belfast Fire Department at the scene. The home was located on a narrow lane off Route 3.